Background illustration: “Merry Christmas my friends from Kiev, Ukraine” (by Valerii Tkachenko). 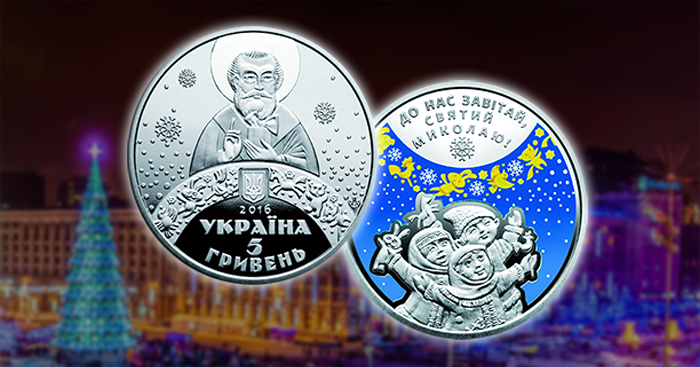 On December 12, the National Bank of Ukraine released a new, festive coin—just in time for the holidays, taking into consideration both the Western Christmas celebrated on December 25 and the Eastern Christmas celebrated on January 6. The coin is also dedicated to the love for one’s neighbor. He sees you when you’re sleeping—he knows when you’re awake—he knows if you’ve been bad or good … so be good for goodness’ sake…! Before Christmas Eve, children all over the world write letters to Saint Nicholas, who lives in the northernmost part of the globe, with their wishes for special gifts. Many children, waking up on Christmas day, are treated to Christmas presents of toys and games—though quite a few children also receive socks, pajamas, and holiday sweaters thrown in for good measure. Christmas Day, for many families all around the world, is a very special time not only for exchanging presents and gifts, but also for being with family and loved ones, for giving thanks for our good fortune, and of course for celebrating the birth of Jesus Christ and remembering the story of the Nativity. Wishing a very happy Christmas to everyone all over the world! 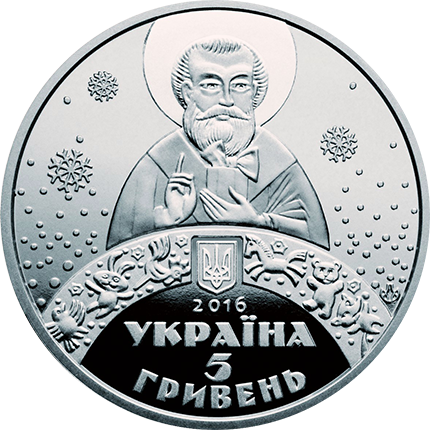 This new commemorative coin, designed by artists Volodymyr Taran, Oleksandr Kharuk, and Sergey Kharuk, is struck by the Mint of Ukraine on behalf of the National Bank. 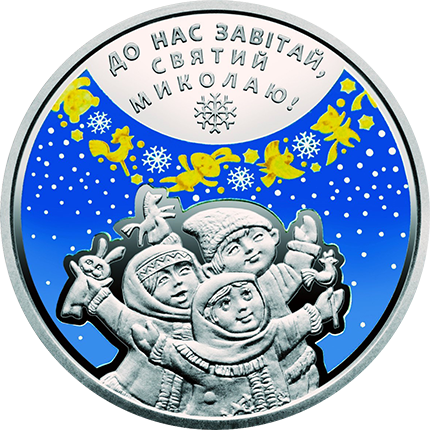 The obverse of the coin depicts a stylized but traditional depiction of Saint Nicholas above an arching banner of toys within which is nested a small state emblem of Ukraine. In the lower part of the field are the year of issue, 2016; the inscription УКРАЇН (“Ukraine”); and, in two lines, the denomination, 5 ГРИВНЯ (“5 Grivnia”). To the right of the primary design is the logo of the Mint of the National Bank of Ukraine. The reverse of the coin shows, in three lines, the text ДО НАС ЗАВІТАЙ, СВЯТИЙ МИКОЛАЮ! (“We have come, Saint Nicholas!”) above the primary design: a group of three happy children with toys in their hands. In the background, to which color is applied, the banner of toys from the reverse appears above the children (arching in the opposite direction), along with snow falling against a blue sky.